Brief Summary: Email migration is a headache of those clients who doesn’t know about the email migration or secure data transfer. “Thunderbird to Outlook migration”, it is a very complex and tedious task for those users, who doesn’t know about this conversion process. Therefore, in this article we will describe all possible method for importing Thunderbird mailbox to Outlook with its consequence. Brief About Mozilla Thunderbird Mozilla Thunderbird proved to be one of the most used email clients of the world’s best email clients. Thunderbird is a list of flexible and reliable email clients included as an open source. Additionally, many operating systems like Windows, Apple OS and Linux are working and compatible. Because of which it is used to send and receive email in organizations. Thunderbird is also useful for News feed, Chat and News Group. Currently, this is the only email client that is logical to use on any operating system. It uses POP, IMAP and SMTP protocols to add multiple accounts and configure with the online email clients like Gmail, Yahoo, etc. Despite of this fortunate email client, user wants to move mailbox from Thunderbird to Outlook. So, the question arise that why is necessary to import Thunderbird mailbox to Outlook. Let’s find the key points of this migration process. Why to export Thunderbird in Outlook? If Thunderbird is the best choice for users then Outlook is perfect for corporate and enterprise users. Because, Outlook has changed its features very swiftly and improved platform parameters like: Today, Outlook runs in Android and Windows phones, supports 90+ languages, complete data protection, configuration with Exchange Server, creates tasks, organizes meetings, RSS feeds and many more … So, “How to migrate mailbox from Thunderbird to Outlook”, one more question is knocking on head. This type of migration is possible with three methods, in which two manual methods and one is direct method. Make a new folder into your Gmail and give a name like Thunderbird mailbox or anything else. Enable IMAP in Gmail setting and allow less security app to easily access your data from Thunderbird to Gmail. Now wait until the all data exported from Gmail to Outlook in PST format. Mozilla Thunderbird supports EML and MBOX format so we can take a backup of Thunderbird mailbox in EML format. It followed by drag & drop method or using import export tool. Now use drag & drop method to export all data into the new folder. Install it on your Thunderbird and click on Restart Now. Again click on Tool tab >> import export tool >> export all messages in the folder >> choose EML format. Save your location and wait until the conversion end. In this process, you can also import EML files into MS Outlook using Drag & Drop method as above we have exported EML files from Thunderbird. 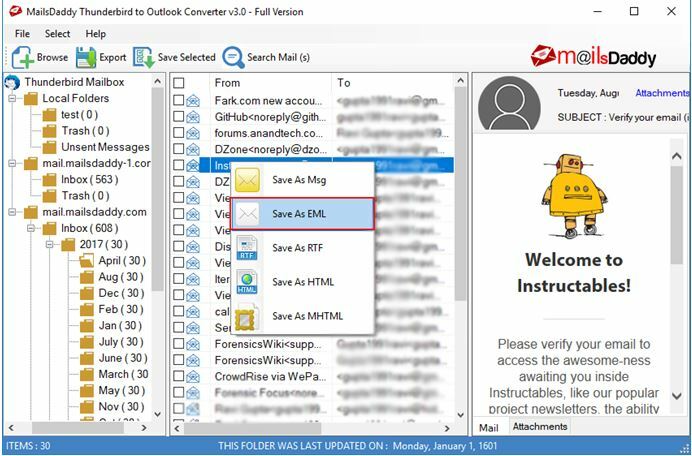 Note: You can also use Window live mail to import EML file into Outlook because Microsoft Outlook allows you to import Window live mail mailbox. OR use MailsDaddy EML to PST converter as a straightforward solution and import multiple EML file into Outlook in safe mode. The manual method is absolutely free but it can be helpful for few email data, because it comes with more errors and drawbacks with huge data such as damage pictures / attachments, unorganized folders, loss data properties etc. At the same time it requires some technical knowledge otherwise you lose your Thunderbird data. Any third party solution should be well programmed to import complete data from one email to other mail client without any interference or error. Apart from this, special features should be embedded, which can be used during importation. So we suggest adopting MailsDaddy Thunderbird to Outlook converter to migrate Thunderbird mailbox to Outlook safely. I found this tool on C-net website after a long search and I used this tool on my 8 GB data. The software is professionally designed for transferring Thunderbird mailbox to Outlook in few simple clicks. The tool also performs the process of conversion without losing or damaging any data and it also maintain all optimal body, attachments and Meta data like To, Cc, Bcc, etc. Select single or separate PST Merge option for all MBOX data. Save your desired location and click export. It will show the confirmation message when all data converted to PST format. This is a hassle-free and error-free solution to convert Thunderbird to Outlook at any time. It is compatible with all window and outlook version, whether old or new. Company offers to use its trial version free of cost and get familiar with the tool features.